Comet 200834A. Sold as (2) Pack. Washers for TAV/2 Torque Converter System. 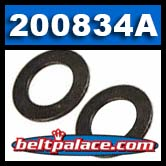 Home > Comet Clutches and Parts > Comet 200834A (2) Pack Washers for TAV/2 Torque Converter System. Comet 200834A, (2) Pack Washers for TAV/2 Torque Converter System. Comet 200834A (2) Pack Washers for TAV/2 Torque Converter System. Comet 200834A. Sold as (2) Pack. Steel Washers for TAV/2 Torque Converter System. Genuine OEM Part from Comet Industries. Comet 218352A TAV2 Kit. OEM TAV 2 3/4 DRIVE 12T 35P. Comet 218352A TAV2 Complete kit. OEM: TAV 2 3/4 DRIVE 12T 35P. Genuine Comet Industries Torque Converter Made in USA. Kit includes Drive and Driven Clutch, Belt, Mounting hardware, and Belt Guard. TAV2 Asymmetric torque converters have an overdrive ratio of 0.90:1.